"Who's fault is it? Is it yours or is the world out to get you?" STX Entertainment has debuted the official trailer for The Upside, the American comedy remake of French film Les Intouchables, or The Intouchables, first released back in 2011. This new version of the film takes the same concept and same characters and sets it in New York, adding way too much dumb humor. It's described as a "comedic look" at the relationship between a wealthy paraplegic and an unemployed man with a past criminal record who's hired to help him. Kevin Hart stars, with Bryan Cranston as the paraplegic, and a full cast including Nicole Kidman, Julianna Margulies, Tate Donovan, and Aja Naomi King. Like many, I adore the original film, but this is a slap in the face to that one. I was hoping it might turn out okay, but putting Kevin Hart in it was a sure sign they would take out any of that authenticity in place of stupid humor (like the shower scene). Ugh. 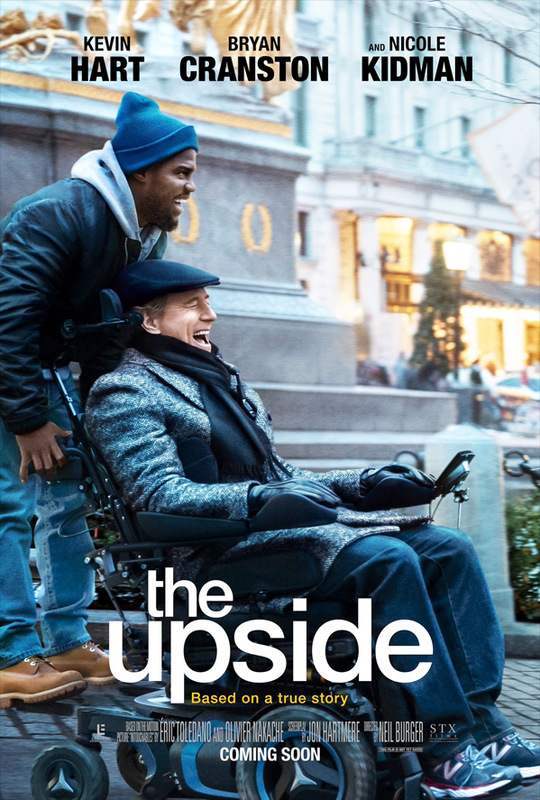 The Upside is director Neil Burger’s heartfelt comedy about a recently paroled ex-convict named Dell (Kevin Hart) who strikes up an unlikely friendship with a paralyzed billionaire named Phillip (Bryan Cranston). The Upside is directed by American filmmaker Neil Burger, director of the films Interview with the Assassin, The Illusionist, The Lucky Ones, Limitless, and Divergent previously. The screenplay is written by Jon Hartmere; based on the 2011 film Les Intouchables by Éric Toledano and Olivier Nakache. This initially premiered at the Toronto Film Festival last year. STX Entertainment will release Burger's The Upside in theaters nationwide starting on January 11th, 2019 early next year. First impression? Anyone?